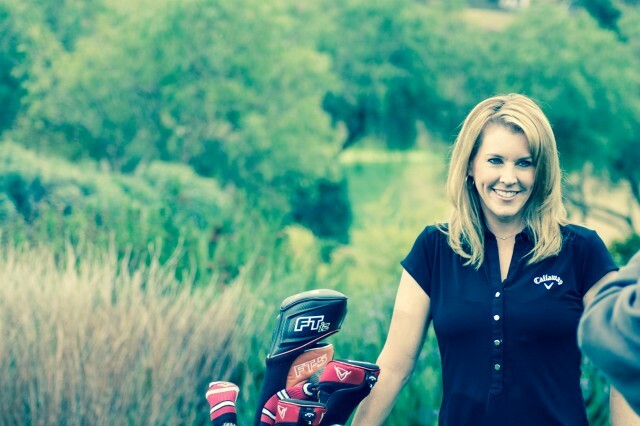 Callaway Golf Ambassador Tina Mickelson knows a thing or two about San Diego. Not only has she spent lots of time on the region’s many golf courses (just like her brother, Phil Mickelson), but she also loves to get out and explore the region with family and friends. In San Diego, “everyone is very welcoming,” says Tina. 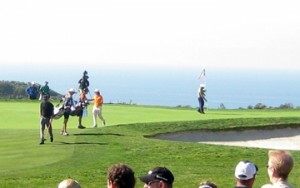 We welcome you to join Tina Mickelson, one of San Diego’s Guides to the Good Stuff, in exploring what makes San Diego a great place for golf-lovers and non-golfers alike. With more than 90 courses in the San Diego area, it can be hard to pick a favorite. However, Tina guarantees you’ll love the game on these courses. Torrey Pines Golf Course: You get to see the wonderful views of the ocean,” she says, “and hear the waves crash.” Tina insists that these will help take the edge off any bad day on the course! The Grand Golf Club at the Grand Del Mar: Tina loves how each hole is arranged so that you can’t see any other hole while you’re teed up. Plus, “you can’t beat the amenities here,” she adds. 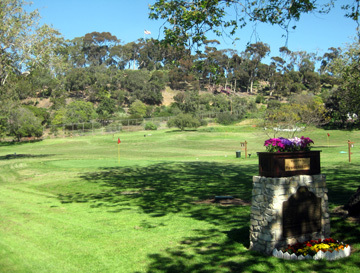 Steele Canyon Golf Club: Tina loves the variety of the holes as well as the scenery you get out in San Diego’s diverse East County landscape. How would Tina spend a day in San Diego? Besides golfing, of course, she’d relax by the beach or at a spa, do some shopping and enjoy some of San Diego’s great cuisine. Spa day: Relaxing with a massage is one of Tina’s favorite activities. “I love the spa at Estancia in La Jolla,” she says, but she also notes that with so many great spas in San Diego, you don’t have to look far to find a good one. Dinner with a view: “It’s very common to be able to accommodate a great dinner with a great view, especially at sunset,” shares Tina. She recommends the ocean and bay views from restaurants in Coronado or downtown. Check out more recommendations from Tina Mickelson, including tips for the perfect date night, at sandiego.org/goodstuff. Presidio Hills Golf Course in Old Town opened in 1932, making it one of the oldest par-3 courses in the United States. For those accustomed to playing a full-length championship golf course, Presidio Hills Golf Course may not seem like much at first glance. But dismissing it would be a big mistake. Presidio is one of the oldest par-3 courses in the country. It was built in 1932 under the direction of notable golf course architect William Park Bell, who didn’t make a hole over 100 yards — the 94-yard fifth hole is the longest — but did use the hollows and hills to provide a challenging short-game experience for advanced golfers without discouraging beginners. A young golfer tees off on Presidio’s 39-yard first hole. The clubhouse, known as La Casa de Carrillo, is a registered Historical Landmark. Home to Josefa Carrillo after being built in 1802, it is the oldest adobe dwelling in San Diego. Even if you’re in a hurry to get on the course, make sure to spend a few minutes reading the newspaper clippings on the wall. You’ll be interested to learn about the course’s history as well as the notable players whose footsteps you’re following. 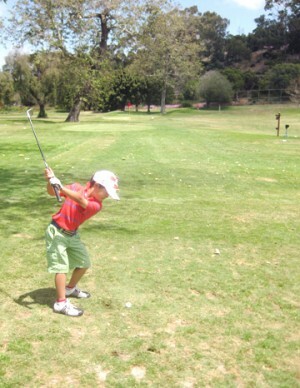 The roots to San Diego’s renowned junior golf program run through Presidio. And, in fact, the course hosted some of the best junior golfers in the world from 1968-2002 in the 10-and-under flight of the Junior World Golf Championships. Phil Mickelson won a title there in 1980, Tiger Woods won in both 1984 and 1985 and Lorena Ochoa won in 1990, ’91 and ’92. Bush said Mickelson still brings his children out to play the course now and then. Memories no doubt bring Mickelson back, but the relaxed pace of play is what appeals to many golfers. The city-owned course was operated by the Abrego family for more than 70 years. It fell into disrepair over the past decade under different management. New general manager Justine Lee has been the driving force behind improvements to get the course back in shape. He had the 11th, 12th and 13th holes rerouted, the tee boxes improved and greens redone, fresh signage put in place and some equipment replaced, all indications of the course again being cared for. Bush is making an effort to expand play for tournaments and special groups, but what he really enjoys is introducing kids to the course. Junior clinics and lessons and summer classes are available to local kids as well as those visiting from out-of-town with their parents. Information is available by calling the course at 619-295-9476 or going to the Presidio Hills website. A grand opening party was held by the new management at Presidio on Saturday to reintroduce the course to the community. Among the children and families enjoying the afternoon during Saturday’s grand opening party were a couple of tourists from Phoenix. Joseph and Ann Lemaitre’s visit to Presidio Park for 18 holes in the afternoon seemed as important as the one they had planned later in the day to PETCO Park to watch the Phillies and Padres for nine innings. 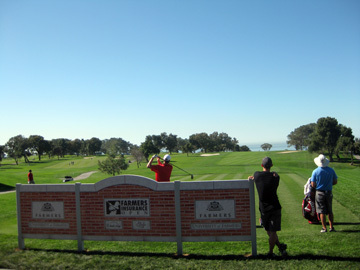 Watching the world’s best golfers is what draws fans to the Torrey Pines Golf Course for the Farmers Insurance Open. The wide assortment of promotional booths, sponsor tents and other activities at the entrances and along some of the fairways is a pleasant surprise that makes the experience even more memorable. The Kodak booth and the Military Appreciation Pavilion, both located adjacent to the South’s 14th green, are two of the more popular places. Thousands of fans have taken advantage of the opportunity to get their picture taken at the Kodak booth. Amber, Piper or one of the others in the booth position their subjects in such a way that the hole and/or the ocean serve as a backdrop. In some instances a fan’s favorite player can even be seen in the background putting out on the green. Within a few minutes of having their photo snapped, the fans are handed a free souvenir to take with them. “That’s a cute picture of all of us,” one woman said to her friends as they walked out. 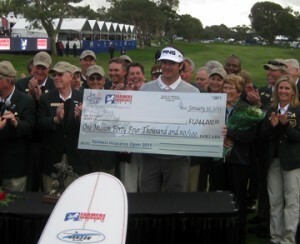 Glenn and Donna Harris get a souvenir photo to remember their visit to the Farmers Insurance Open. Marine Sgt. Joseph Barton replaces the flagstick on the South's 14th hole after one of the groups finished playing it. 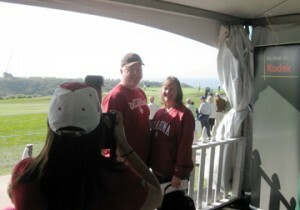 Glenn and Donna Harris of McLoud, Okla., were were wearing Oklahoma sweatshirts as they followed the group that included Anthony Kim, a Sooners alumni. The Harris’ ducked into the Kodak booth for a picture before heading over to the Military Pavilion. Glenn, a chief petty officer in the Navy, was stationed in San Diego recently. As an active military member, he was entitled to enjoy the Military Pavilion sponsored by the Padres. There was a line to get in much of the afternoon, with service members and their families enjoying complimenary food and beverages. A few uniformed Marines had the added honor of getting to take turns standing behind the green on the 14th hole and replace the flagstick — which had a small American flag on it — after each group completed the hole. “I play golf myself, so I was all over it,” said staff sergeant Joseph Barton of Gainesville, N.Y., who has been stationed in San Diego the past five years. “I was in for John Daly’s group and Phil Mickelson’s group with Rickie Fowler, and Mr. Kim just came through. Barton was eager to get back to the base. “I’m just going to go back and gloat about it now,” he said. Barton was accompanied by staff sergeant Sheldon R. Edwards, who was still talking about getting an autographed golf ball from Daly earlier in the week. “That’s the one I really wanted,” said Edwards, who is from West Virginia. It wasn’t the one he really NEEDS, though. The reference was to the world’s largest Marine Base. By distance it is only 150 miles or so from San Diego. By climate? That’s something else altogether. A temperature of 119 degrees was recorded at Twentynine Palms one summer day a few years ago. Edwards hopes the sergeant major was joking. Phil Mickelson and Bill Haas share the lead coming into Sunday’s final round of the Farmers. Woods, who slipped from the leaderboard Saturday with a 2-over-par 74, is eight shots back and likely in no mood for signing autographs. The gallery gravitated toward the group of Tiger Woods, Rocco Mediate and Anthony Kim on Friday as the players made their way from the 15th green to the 16th tee at Torrey Pines South. 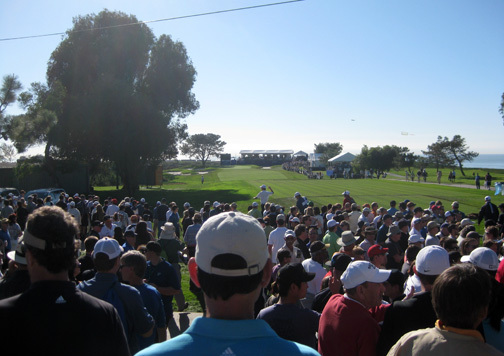 Fans packed the stands behind the 15th green on the South Course at Torrey Pines and lined the ropes that fence off the green and fairway as the group that included Tiger Woods, Rocco Mediate and Anthony Kim approached during Friday’s second round of the Farmers Insurance Open. One young man, probably one of the more resourceful fans and certainly one of the most agile, scaled a tree to get a better view of things. Tournament officials try to be as accommodating as possible for spectators. Within limits. And mindful of liability. The youngster returned to earth and followed his father to another spot behind the green to get a glimpse of the proceedings. They — along with perhaps 20,000 others on the grounds — enjoyed another day of beautiful weather, good times and great golf. There was a Tiger sighting, as expected. Unanticipated was when Phil Mickelson’s group spotted some snakes. Animal Planet would be interested to know that there was even mention of monkeys. Just another day at the Farmers, which could be a zoo come the weekend the way things are going. Kim excited the crowd early with birdies on each of his first four holes. Woods matched the feat with birdies on the third through sixth holes. They, along with everyone else, are looking up to leader Bill Haas, who birdied three of his first five holes and shot a 6-under 66. It was good enough to go 11-under for the tournament, two strokes better than Kim (who carded a 67) and three shots better than seven other players (Mickelson, John Daly and defending champion Ben Crane among them). Woods shot his second straight 69, putting him five shots off the lead. It was on the tee box at No. 9 on the North Course where someone in Mickelson’s group spotted a couple rattlesnakes tangling with each other down in some canyon brush below. Next thing you know, players and caddies are on a nature excursion, momentarily captivated like little boys. Soon enough it was back to the task at hand. And the monkeys? Kim can explain that. As thousands will attest, Kim is playing now like one of the best golfers on the PGA Tour. The field has been trimmed nearly in half, to the 79 players who made the cut at 1-under-par. The first groups for Saturday morning’s third round go off the South Course at 7:40 a.m. Kim is in the final group with Haas and Fredrik Jacobson, teeing off at 9:50 a.m. Mickelson tees off 10 minutes before with Bubba Watson and Rickie Fowler. Woods’ tee time is 9:10, in a group that includes Kevin Sutherland and Jhonattan Vegas. 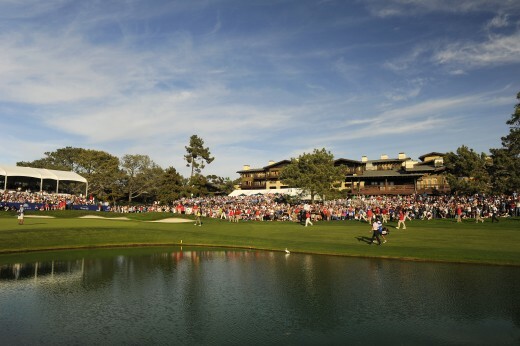 Spectacular shots at Thursday's opening round of the Farmers Insurance Open were rivaled by the spectacular weather and surroundings at the Torrey Pines Golf Course. 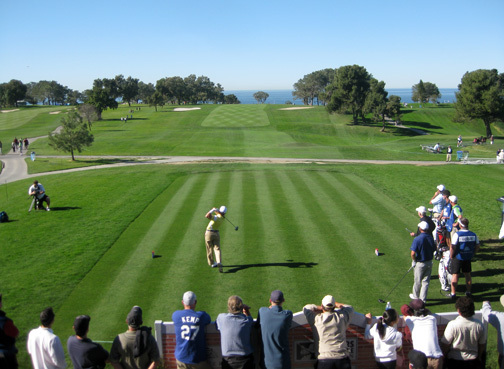 Tell that to the thousands of fans who thoroughly enjoyed themselves Thursday walking the grounds of the North and South courses at Torrey Pines for the first round of the Farmers Insurance Open. Spectacular was more like it. The weather was magnificent, the scenery was stunning and the golf was great. The spectators saw South Korea’s Sunghoon Kang shoot an 8-under-par 64 to take a one-shot lead. They watched three other players come within two strokes of Kang and 10 others — including hometown favorite Phil Mickelson and John Daly playing the South — three strokes back after shooting 67s. They witnessed six-time champion Tigers Woods open with a 69 on the North. Kang’s round was highlighted by an eagle on the North’s 14th hole, a 526-yard par-5. Kang actually hit over the green with his second shot but chipped it into the hole coming back for the eagle three. 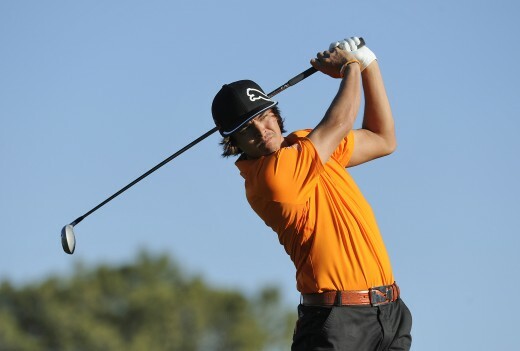 Interestingly, he is one of four rookies — along with Chris Kirk, Keegan Bradley and Fabian Gomez — among the top five players following the first round. It would be pretty remarkable for one of them to pull off a victory here. The event hasn’t had a first-time winner in 20 years. The rookies are similar to spectators walking the course in that many of them are excited simply for the opportunity to get a glimpse of veterans like Woods and Mickelson up close. Mickelson, who has won this event three times, position himself to make a run at a fourth title. It wouldn’t be surprising. Mickelson is something of a fast starter, winning in his first PGA Tour event of the season five times during his career. The emotion was similar for Woods in his season debut. He seemed to enjoy the atmosphere as much as everyone around him did. 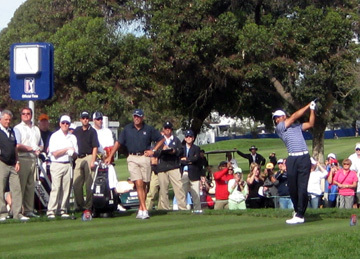 Tiger Woods tees off in Wednesday's pro-am at Torrey Pines. The last time Tiger Woods walked the grounds of the Torrey Pines Golf Course was during his 2008 U.S. Open playoff victory. It was just Woods, Rocco Mediate and about 30,000 fans who made the surroundings seem more like a rock concert than a golf tournament. Woods returned Wednesday morning — and so did the crowds. Maybe not 30,000, but, heck, this was only the pro-am. The four-day tournament begins Thursday morning. Woods is again paired with Mediate — hmmm, that seems like more than just a coincidence — and young Anthony Kim in a group that tees off at 9 a.m. on the 10th hole of the North Course. Most of the pros had a handful of people — perhaps a dozen — following them during the pro-am. Hometown favorite Phil Mickelson’s gallery was the largest, numbering into the hundreds, before Tiger stepped to the tee. Upwards of 800 people gathered when Woods went off Wednesday on the South Course’s 10th hole. It seemed like each one of them was holding up a camera — or a camera phone — to record the moment. They knew to get their pictures while the getting was good. Spectators are allowed to take photos the first three days of the week, then it’s left to the professionals. To limit the distraction of shutters and flashes going off at inappropriate times, only media members are allowed to photograph the players once the tournament begins. Tournament officials expect the presence of Woods — who missed the 2009 tournament recovering from a knee injury and last year’s event because of personal problems — will bring an additional 30,000 spectators out for the event. He brings out an extraordinary number of people to chronicle his exploits as well. The interview area was expanded this year in the media tent in anticipation of Tiger’s participation. Nearly two dozen television cameras, a dozen still photographers and 70 writers filled the room to overflowing for his morning press conference. 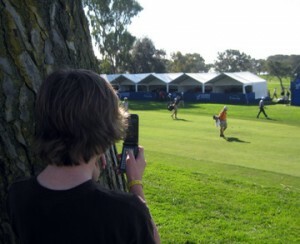 A young fan snaps a photo of Tiger Woods walking up the 18th fairway at Torrey Pines South. Nearly two dozen television cameras were trained on Tiger Woods while 70 members of the media sat and took notes during a press conference before Wednesday's round. That’s Woods’ rock-star status on the Tour. How’s this for a contrast: Jhonattan Vegas, fresh off Sunday’s victory in the Bob Hope Classic, entered the interview room a minute after Woods departed. By the time Vegas settled into his chair, all but three of the TV cameras had been packed up and fewer than a dozen reporters remained seated. Reaching the green in two shots on the hole — especially with the pond guarding the green — is a quite feat, even for the pros. After Woods chipped on and putted out, it was on to the No. 1 tee, where he quickly hit and was on his way again. “Oh, I just missed him,” said one disappointed fan who walked up as Woods made his way down the first fairway. Not to worry. There will be plenty of opportunities to see him and the other 155 players entered in the tournament. Woods said he holds a special place in his heart for San Diego in general and Torrey Pines in particular. “I came down here and watched Andy Williams (the tournament’s sponsor from 1968-88), so for me this was the first PGA Tour event I’ve ever seen,” said Woods, whose father Earl brought him to the tournament as a youngster. “It obviously goes way back for me. . . . I played here as a junior. I came down here and played the South Course when I was 7 or 8. So it goes way back for me. Woods has won this event six times, including four straight titles from 2005-08. And how does Mickelson expect Woods to play this week? Paul Stankowski begins practice round at Torrey Pines North. 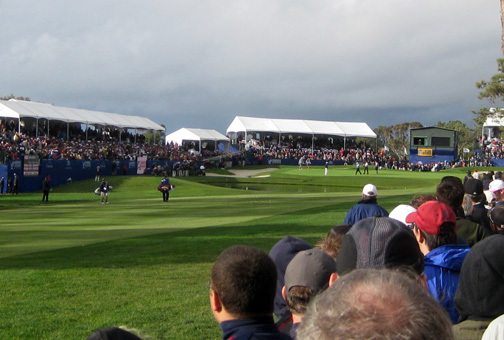 Monday is always very casual the week of the Farmers Insurance Open at the Torrey Pines Golf Course as final preparations are made for the PGA event.